The Buffalo nickel or Indian Head nickel was a copper-nickel five cent struck by the United States Mint from 1913 to 1938. The coin was designed by sculptor James Earle Fraser. As part of a complete overhaul the US Mint had begun a drive to improve the look of US coinage and as such five new designs were introduced between 1907 and 1909. Jame Earle Fraser was commissioned to replace Charles E. Barber's Liberty Head Design on the 5c coin in 1911 as part of this drive to beautify US coinage. 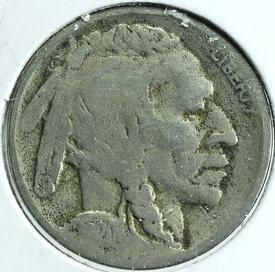 Impressed by Fraser's Native American and Bison designs approval for the new coin was given in 1912. The new design was however delayed for several months because of objections from the Hobbs Manufacturing Company, which made mechanisms to detect slugs in nickel-operated machine. The company was not satisfied by changes made in the coin by Fraser, and in February 1913, Treasure Secretary Franklin MacVeagh decided to issue the coins despite the objections. Despite attempts by the Mint to adjust the design, the coins proved to strike indistinctly, and to be subject to wear—the dates were easily worn away in circulation. In 1938, after the minimum 25-year period during which the design could not be replaced without congressional authorization had expired, it was replaced by the Jefferson nickel designed by Felix Schlag.